Renowned writer Namita Gokhale was awarded Sushila Devi Literature Award for her work "Things to Leave Behind". She was honoured in the 'Best Book of Fiction Written by a Woman Author' category at the inaugural edition of Bhopal Literature and Art Festival. Sushila Devi Literature Award is constituted by Ratanlal Foundation. The award recognises the Best Book of Fiction Written by a woman author. It is a newly constituted award and comes with a cash prize of Rs 2 lakh. Bhopal Literature and Art Festival was the brainchild of former bureaucrat Raghav Chandra and was Conceptualised by the Society for Culture and Environment, Heartland Stories. The festival draws inspirations from glorious traditions and rich history of Central India. The literature festival is organised by the Society for Culture and Environment, Heartland Stories in association with Sahitya Akademi. 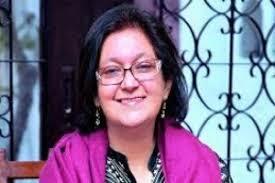 Namita Gokhale is an Indian writer, publisher and festival director who has authored sixteen books including nine works of fiction. She has also conceived and curated over a hundred episodes of 'Kitaabnama: Books and Beyond', a book-show broadcast on Indian's national broadcaster Doordarshan. Namita Gokhale is a founder-director of the 'Jaipur Literature Festival' along with William Dalrymple. She has also served as member-secretary of Indian Literature Abroad (ILA), an initiative by the Ministry of Culture, Government of India, to translate and promote contemporary literature from the Indian languages into the major international languages, particularly the six UNESCO languages (English, French, Arabic, Spanish, Russian and Chinese). Q. Which renowned writer was awarded Sushila Devi Literature Award for her work "Things to Leave Behind" at the inaugural edition of Bhopal Literature and Art Festival?